What readers are presented with here is a more or less mundane, ordinary evening amongst a given social set. The real action is in how it is presented. 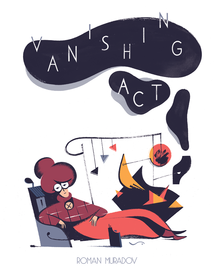 Vanishing Act is – or, at least, may be – an attempt at a cubist graphic novel. It presents a cast of 19 inter-related characters (3 of which are non-human) in 13 scenes transpiring over 140 minutes, each in a unique location, each with a unique combination of characters, andeach rendered in a distinct style. Furthermore, each of the scenes chronologically overlaps the previous and subsequent scenes (with the obvious exceptions of the first and last scenes, which only overlap the subsequent and previous, respectively). 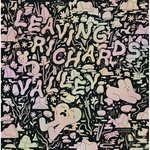 Are you following? This is where the cubistic aspect comes in: As comics are a temporal based medium – as opposed to single image paintings, which is what we most closely associate with cubism – Muradov is expressing the cubist impluse through the simultaneous overlappings of character, scene and place, through style, allowing one to view the passage of time through person and place from simultaneous multiple points of view – et voilà, cubism! (well, sort of) Anyway, it's certainly makes for an intriguing reading experience. And, for anyone worried about being able to follow it all, Muradov has anticipated this, and has helpfully supplied both spacial and temporal maps, along with a cast of characters that graphs their scenes.